Lamb Curry With Spinach - low carb and incredibly simple. The photo may not do this justice (all curry looks pretty bleh in a photo) but this lamb curry with spinach is simply delicious. 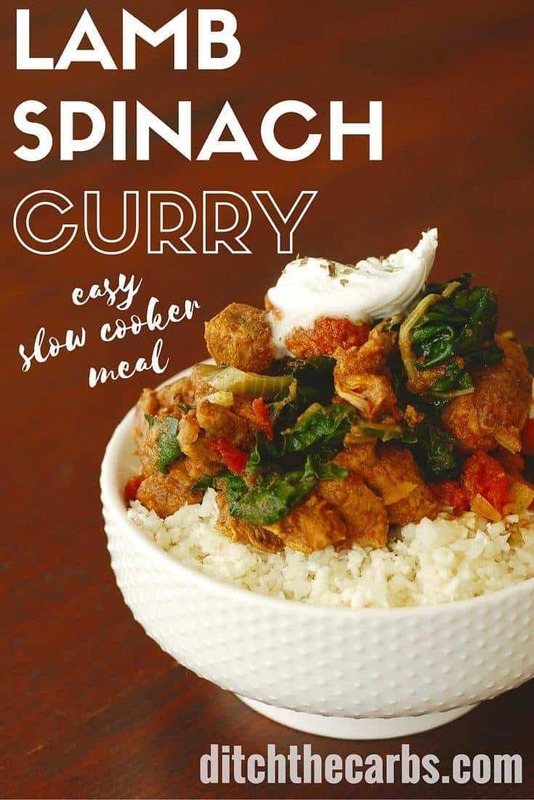 Lamb curry with spinach cooks in the slow cooker all day, and uses a whopping 500g of spinach. I told my children it was silverbeet (for some reason they love silverbeet, but hate spinach – go figure) and they ate it all up. They know by now I play tricks on them, they eat it, and are surprised they liked it once I reveal what was actually in it. This trick has managed to get them to eat a whole selection of foods that they once hated. Serve with more veggies, or cauliflower rice. 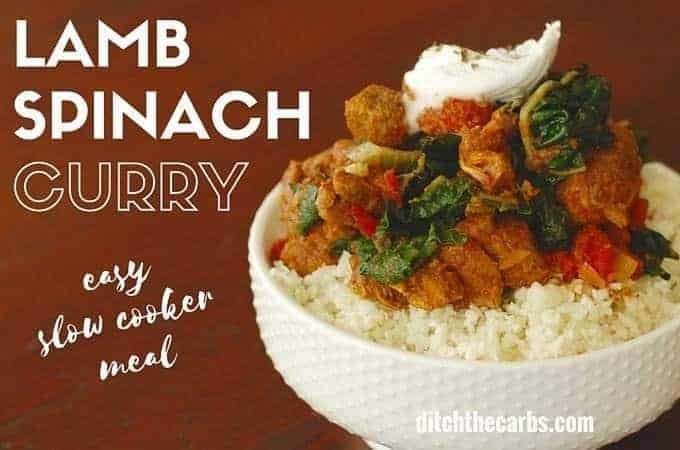 Place lamb curry with spinach in the slow cooker in the morning, and come home to an amazing home cooked meal. Defrost the spinach in the microwave, then squeeze handfuls to get out the excess water (don't squeeze too hard and make it dry). Place all the ingredients in the slow cooker, stir. I made this 2 times and played around with the spices and I didn’t get very good results. The dishes turned out bland. I can smell the aroma but the taste is like eating dirt. Any suggestions to get a more Curry like flavor? What spices should I add more of? Less of? If it smells amazing but tastes bland I would check your spices and ensure they haven’t expired! This dosen’t sound right at all. Also remember to add salt to taste. Salt always brings out the flavours. Coconut milk is too thin and watery, and not high enough in fat. You won’t get that same creamy texture that curries generally have. Thanks for the reply! In the crockpot now, 15min till in my tummy!! Used fresh spinach, it is very watery, sorta of Lamb Saag Soup? But flavors are spot on so all good by me. I did add 1 tsp cinnamon, just because I think it goes well with all those spices. Thank you! Thank you very much for posting this delicious looking recipe! I think I will try it tonight! 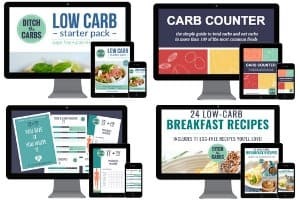 I have been a bit discouraged because I was recently diagnosed with diabetes and the dietitian told me I need to eat more carbs in order to balance my blood sugars. They are fine all day, but start to rise in the evening and are over the limit by the AM. She thinks my liver is leaking because my carb count is too low, but a snack at night has not made a difference so far. Does anyone out there know about leaky liver, or know where i can find out more about it? In all my years I have never heard of a leaking liver because your carbs are too low? Check out this article and join Type1Grit (just as helpful to those with T2) and get some fabulous advice from those who live with diabetes every day and know how to achieve normal blood sugars. They are wonderful. Thank you, Libby. I will check them out. Just to clarify, apparently the liver stores extra sugar as glycogen and then releases it as glucose when your blood sugars go low, such as overnight or when you go too long without eating. Sometimes it releases too much or won’t stop, especially if you have liver problems such as a fatty liver. Somewhere or somehow this process is called “leaky liver”, although I’m not sure just what that means. What this shows me is that diabetes is a much more complex condition than previously thought, and, to get better, we need to take care of our whole bodies, not just one part. I will keep looking. Thank you again for the links, and I love your site! Thanks, I did wonder if it was a local term used. Any difference using fresh spinach? I often use fresh spinach or even silver beet/swiss chard. They all work really well.